Topic: Shall we start keeping bees in Singapore? Shame, another bee colony is gone. Each time I learn that a swarm in the house or a hive on a tree has been sighted, immediately removed and destroyed by the pest control company, I seem to lose that last figment of my imagination about keeping bees in Singapore. Then in the recent years, I saw another, yet another uplifting example of urban beekeeping in modern cities (like Tokyo, Hong Kong, New York) and the mushrooming of wildlife sanctuaries all over the world. They gave me a glimmer of hope for where I live and kindled a desire to do the same. "Please don't, Ruth, many people are going to be terribly upset if you propagate the idea of beekeeping in Singapore! They will blame you for causing worry about bees stinging them, their children, and their pets" Yup, not surprising, many people are sceptical. "Well okay, so what fraction of the people will be upset? What can be done to alleviate their fears abut keeping bees in Singapore? How can we inspire and create an awareness of the importance of bees to transform our people's attitudes and shift the government's thinking? Can we overcome what is stopping the country from welcoming the bees? Or have we even thought of trying to co-exist with the bees harmoniously in the first place? I am curious if I can in anyway help change some minds. And remembering how the fear of getting stung by bees in the past had not allowed myself to even entertain the idea of keeping bees pointed me to "Yes, it too can happen to others." I am still a complete greenhorn in beekeeping (possessing only knowledge from literature and my online exchanges with beekeepers) and still frown at the thought of being "kissed" by the bees (huh, who likes to be pricked? ), but my inclination to do something about the bees and our natural space grew and pushed my concerns about bee stings by the bit to the back of my mind. Who am I? I'm a "nobody" in the Who's Who World of Beekeepers or Nature Conservation. But for the sake of establishing some association with this discussion topic, perhaps I should inform that I run the hugely popular website Benefits of Honey , which aims to transform the way people think about sugar. Our children and our children's children need to recognise the difference between good and bad sugars and wake up to the dangers of high fructose corn syrup and artificial sweeteners. Benefits of Honey's key message - Honey isn't just sugar (most doctors would say this is utter gibberish). And as an advocate of honey, I cannot brush the bees aside. They are the giver of honey. When the bees disappear, their honey will also cease to flow. No bees, no honey - a crystal clear fact. They are so vital to our food chain and environment. And the best honey to eat as I always believe is honey purchased direct from the beekeepers, who of course do not exist in every city (at the moment). Eating local does not only reduce our carbon footprint, it also gives you that peace of mind and assurance of knowing where your honey comes from, what goes into managing the bees, and what exactly you are eating. Furthermore, the production of honey and its related products means the creation of many income-generating beekeeping related activities. And when research studies have presented enough scientific evidence of the honey medicinal benefits that have already long been experienced and testified by our grandmothers and mothers, honey is going to flow into the kitchen of more households, restaurants, cafes, into the recipes of food, the ingredient list of cosmetics and beauty products, as well as over-the-counter medicine, and even become recognised as a much more effective wound treatment in our hospitals for cuts, infections, and burns compared to conventional drugs. 1. Farm Mart at Chua Chu Kang is the only place that you can see live bees - one beehive kept in a glass container for display as an exhibit. 2. You can keep bees at our own backyard as a hobby here; no licensing is required since bees are not animals and food. However, when neighbours find that the bees are a nuisance or complain about their danger, National Environment Agency (NEA) will intervene and the bees will be removed. 3. Bees bought and imported from overseas need approval from the NParks and their potential impact as invasive pests on the local biodiversity will have to be assessed. The bees must be of a native species and should not disrupt the current biodiversity of the environment. If you wish to catch bees from the parks here yourself, approval from the NParks is required as this may affect the local biodiversity balance. 4. Bee farming requires licensing from AVA as it will be treated as agricultural use. The farm has to be on sites that are zoned or released for agriculture use. Land approval is required by Urban Redevelopment Authority (URA). Asessment to find out if the proposed use could pose any disamenity to the neighbours is also required. The honey produced in the farm has to be tested free of any toxic substances from nectar collected from flowers of toxic plant species. An Update, 26 February 2013 - Beekeeping in Singapore is Not Allowed Now? "We regret to inform that bee-keeping in Singapore is only allowed for exhibition purposes only. The only species of bees that can be kept for exhibition is the species, Apis mellifera mellifera. You would need to be a member of the Biosecurity Assurance Arrangement (BSAA) with AVA before approval can be allowed. On top of that, you are also required to obtain an exhibition licence with the Centre for Animal Welfare, AVA." When did AVA's stance on beekeeping in Singapore change? That really stumped us. And the fact that Apis mellifera (the European honey bee) was not even our local species and it was the only species that could be kept for exhibition further confounded us. So does this all mean that bee-keeping is not allowed here anymore? An Update, 21 May 2014 - Hey, There are Beekeepers in Singapore! Gee, I was taken by a big surprise. Molly, who had just relocated to Singapore from Germany, sent me an article entitled "Bee hives in your backyard? Don't worry" which was published on 17 Nov 2013 by The New Paper (and also in asiaone.com). She was apparently agog over the article that she stumbled upon after learning from our website that beekeeping was not allowed here. The article featured Edible Gardens, an environmental movement that promoted urban beekeeping in Singapore. According to the write-up, the organisation even loaned and installed ready-made empty beehives in the backyards of people's homes for free. However, I found it perplexing that the urban farmer from Edible Gardens on one hand would be willing to be interviewed and photographed by the media while on the other, told asiaone.com he was hesitant about telling his neighbours about the beehive in his garden. A quick scan of their website http://ediblegardencity.wordpress.com/bees/ returned the impression that beekeeping activities did exist here and the team even offered to remove bee hives from homes as well. So, with the media attention, keeping bees after all must be allowed in Singapore then! Somebody from Edible Gardens subsequently confirmed that rescuing bees was part of what they did after I wrote to them. They also expressed the need for bees that would choose sheltered and confined spaces as those which lived in open spaces like trees would not stay in their hives. But much to my dismay, no other information could be obtained as further enquiries about beekeeping here had gone unanswered. For those who wish to get in touch with them regarding keeping bees, their email contact can be obtained from their website. 1. Can We Have the Honey Bee Back, Please? As our country squeezes every effort to erect the most visible signs of modernisation and progress in our living, are we missing out big time on what affluence can't give our children? 2. How is a bee removal done in Singapore? 3. Who wants to start beekeeping in Singapore? 4. A Case for Urban Beekeeping in Singapore. Rooftop beekeeping here may sound out of this world, but look what others in crowded cities are doing. 2. Did Albert Einstein Ever Link Doom of Human Race to Bees? PS: Give your posting some time to be published on this page. This thread is not made to upload postings automatically due to spamming concerns. You too can comment in FACEBOOK or follow the comments of others there. So still no final solution for Singapore to have a bee farming? Reason as my workplace is an open area and to nature. Thus have many bee making hives but each time will have to be removed by pest control. My worry is in long run there will be no more bee left as they are the wild bees. Really hope we have a good solution to save them rather than to kill them. Ruth: Hi Gerald, I don't think there would be any solution for bee farming in Singapore in the near future. The last I heard was that the government was looking into keeping stingless bees in the schools. But even that didn't seem like a cool idea to most people. It's sad to see the honeybees go. I guess with the proliferation of new media technologies and changing lifestyles and preferences, keeping bees wouldn't come across as something too appealing with most people. Hello Ruth, thank you for your wonderful page and sorry for my weak English. 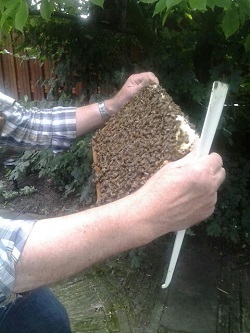 I am a beekeeper in Germany. We have all the support of government and public oppinion. Many schools teach bee keeping. Everybody in Germany knows that we need more beekeepers and more bee colonies in our country to keep our invironment up. I was shocked reading about the situation in Singapore. I am married to a Singaporian and we were debating mooving to Singapore in a couple of years after I finish work. But I do not want to live without bees! I think changing public oppinion is more helpfull than a few half illigeal hives in some backyards. If I lived in Singapore I would try to come together with people who are interested in this item and try to launch activities in order to create support first of all among scientists then in the media and in public. I am convinced that there are many good reasons to support bee keeping in Singapore and not a single one against it. Ruth: Very happy to read your posting, Andreas! Greetings from Singapore! I hope your other Singaporean half wins the debate because Singapore is still wonderful without the bees. We desperately need activists who are keen on pushing beekeeping forward in Singapore. The bee lovers here would love to have you! I love to keep bees naturally. I can get my very own honey, but I like to have a 2 or hives outside my house, so the bees can sting the damn neighbours dogs. too many of them. Hello Ruth, I am a Singaporean living in Belgium for more than 15 years now. I have just started this amazing hobby of beekeeping one year ago. Right now I have one hive in the garden and I have plan for a second hive. Yesterday, a fellow beekeeper asked me if there are beekeeping activities in Singapore too, which lead me to google about beekeeping in my home country. I read your posts from several years ago, it's indeed sad to read that honeybees are treated like pests in Singapore. I can of course understand the fear most people have regarding bees. Four weeks ago, the old queen bee from my hive left the colony with a swarm of workers with her. The sound and sight of the swarm in the air was enough to scare my next door neighbour, eventhough it lasted not more than 10 minutes. Thankfully my neighbour didn't make any trouble about it. And I hope a jar of honey from the spring harvest will sweeten the relationship. Other neighbours are aware of the honey bees in my garden and the reactions I received are positive so far. I think public education about the benefits of the honey bees is important. In Belgium, there are even TV celebraties showing off their beekeeping hobby. I think this helps a bit with the general public's acceptence of honey bees. Of course, losing a swarm of bees is not a pleasant experience and I shall do my utmost to prevent a new swarm in the future. Don't wish to test too much the tolerance of my neighbours. I wonder how it's like for the honey bees in a tropical country like Singapore. I am sure that I shall keep an alert eye looking at flowers in the open the next time I am back in Singapore. Maybe I will spot a honey bee or two. Ruth: Hi Hwee Cheng, greetings from Singapore! 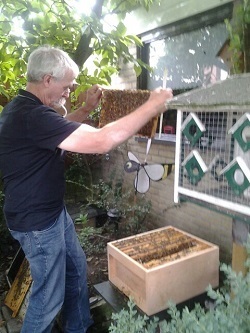 Very interesting to know that TV celebrities in Belgium are helping to promote beekeeping! Fear of insects is often irrational. Most people naturally shun them or become annoyed when they see insects darting around them, even if they don't sting. Due to the fact that bees can sting and make an agressive buzzing noise, a lot more fear is generated when they are sighted. I can imagine how your neighbours feel about the bees swarming in the air. And in Singapore where housing is so closely clustered, people who are found keeping bees can be easily seen as being inconsiderate and anti-social. And public education about the importance of bees as pollinators is highly challenging when people here consume only imported fruits and vegetables. With no farming and crop planting around us, it will take extra effort for people here to appreciate the bees and what they do. I feel that the issue is not so much about how willing we are to accept the bees as part of our environment. To begin with, we don't have the kind of environment and the mind-set to mull over nature and the need to protect nature. We may have a world-class zoo and bird park here, but other than cockroaches, lizards and mosquitoes, most insects, including bees are rather rare topics in our conversations here. However, yes I do hope when you are back in Singapore again, you would be able to spot a bee or two in some parts of the country. That would be delightful. Ruth: Thanks for writing! Yes, have been reading up on the stingless bees in Malaysia and Australia, and exploring the idea of keeping my own hive. Good for you, Sal, you have a mountain range near your home. Even if I could get my hands on the bees to start something, I am wondering if the bees would starve to death due to the lack of trees and plants around my place. I may have to end up doing a lot of my own planting for the bees. The honey from stingless bees is indeed more medicinal compared to the regular honey, but the amount of honey these stingless bees produce is very tiny. Perhaps that's why there is hardly any commercial stingless bees beekeeper around. All the best in getting your hive started and would be delighted to see pictures of your stingless bees (they are cute!)! Ruth: Hi Bela, yup, there are no bees, no honey, and no beeswax in Singapore. I believe there is a handful of private individuals keeping bees on the hush-hush. But I doubt anyone is selling honey and beeswax in a commercial way in view of the regulations here. Hi to all of you! I am also a beekeeper from Philippines. For me Bees are ancient Human Keeper on behalf of us. The truth that we did not realize is they are not just only an insect, without them the world will be lifeless. Thanks for sharing so much about Bees... I'm also interested to be a bee farmer but I think it won't happen back here in SG. But nevertheless, if you need manpower to promote or conduct any talks to the publics, I would like to help out to push for more awareness to our people. Praying hard this day will come. (Hope to be a bee farmer!!!) Cheers!! Ruth: Hello Thomas, Singapore probably would look very different with the bees and beekeepers! Ruth: Congratulations guys! I will definitely contact you if I spot a swarm that needs a new home. But I wonder if I would ever find one here. The bees in Singapore seem to have all disappeared! I would personally love to be a bee-keeper. If someone starts this, I would want to get employed for sure! Ruth: Thanks for the link, Candice! Totally unbelievable! Never thought it was possible! I so wish that bees can be made easily available for us here in Singapore to see this hive work in our homes. Hi Ruth, I am amazed and disappointed that Bee Keeping is not a big thing in Singapore. I know there are Bee Keepers in Singapore, we are everywhere ;-) can you refer me to one that sells hives. I am living in Bali and I have a swarm in my yard [been there for 12 months] living in a Statue. Time to give them a home. Ruth: Sorry to disappoint you, Steve. I do not have any contacts of beekeepers who sell hives here. You probably would have a better chance of getting these things in Bali. Hi, I am a Malaysian who stay in Singapore. Recently I read about some interesting information from a forum about beekeeping in Malaysia. I think it will be fantastic if we able to keep bees here. But prior to that, I think we are lack of knowledge and practical experiences here. We need these to educate/convince the public and authorities to have a safe beekeeping in Singapore. Why don't we just start learning it from a nearby neighbor country Malaysia as travelling to learn there is not that far compare to other places/countries. If we able to form a group here, may be can have some trips to learn at there too. Just my opinion here to share. Ruth: CK, thanks for sharing. My observation is those who are really interested in bees and beekeeping here have already travelled to Malaysia to explore them. You're facing a rather big problem but probably created by beekeepers themselves. If you see pictures of beekeepers they are always wearing protected clothes. My experience is that if you work without them, people get a more friendly sight of keeping bees and are even more enthusiastic when they taste real honey. I always have one colony in my garden and make sure they are not going to swarm. This is how I work with my bees (see the pictures). People passing by are more curious and are less afraid than when you wear all those protective clothes. So, in general beekeepers should work more without protective clothes to show other people that beekeeping is not as dangerous as it looks like. Ruth: Thanks for sharing, Pieter. Interesting perspective. I never thought of that. I always assume that the protective gear is an expected form of "dressing" for professional beekeepers. Beekeeping is fascinating after watching from Youtube. But it's a daunting task to keep one in Singapore where everyone is afraid of stinging and also considering the scarcity of land and population density. And we are not taught nor seen here unless we live in England, US, New Zealand or Aussi. I hope to see a small enterprising group to start one where it's safe to keep and free from people complaining. Hi Ruth, I like to know more about bee keeping. I hope that you can share more on the NEA and AVA reply. I like the idea of self produce honey. Drop me a reply. Hi, this is a great website and I think the idea of bee-keeping in Sg is just wonderful. I am from Indonesia where we have some source of wild forest honey; but forest are getting less, we can't be sure anymore of wild forest honey. I love the idea of having fresh honey for my family. We have many parks in Sg, surely bees can help it grow more flowers. Let me know of any community action on bee-keeping in Sg, I would like to join. Cheers! I am hoping that Singapore gov to be engaged in Bee keeping like other cities of the world. May be some neighbourhood gardening club can help out. Hope we can't meet up someday to discuss this. I happen to live in an apartment where the bees seem to really enjoy making their home in a crack in the roof. Would you happen to know any experienced beekeepers who would like to remove the hive and have them transplanted elsewhere? The family would prefer the bees to be gone but I don't like the idea of having them fumigated. Any advice? Ruth: Hi Nicole, your suggestion has been explored before but so far, nobody has stepped out to volunteer this service yet. I'm afraid you'll still need to contact NEA. By the way, I've always been told that bees will not harm anybody unless provoked. But I understand these buzzing creatures can easily cause quite a commotion, especially among the young kids and elderly. I stay in HDB flat. My dream is to have a hive of bees. I read and watched a lot online about bee keeping. The most interesting and practical bee keeping I have seen is from India where people in the village use pans, pots to keep hives! We can try. I have seen bees swamping nearby. One they went into a clothe bamboo-holder! How I wanted to lure them in my flat. Schools should start bee-keeping program. Bees are tame. I have close encounters with them in Vietnam and Sabah. They behave better than flies! Ruth: Hello Ann, your very interesting note just got me excited on the topic again. Thanks! A beekeeper ever told me before that raising bees is like raising children, they all have different temperaments and behaviours can differ a lot, depending on various factors such as bee species, needs of the colony, weather conditions, etc. I guess the two main challenges related to beekeeping in Singapore are the fact that bees can sting and the public can be very resistant to the idea of having bees around them. Secondly, with the amount of fogging we have in the country, bees may find it difficult to survive here, and I'm afraid we also cannot rule out the possibility that the floral nectar collected by the bees may be contaminated. Hi, I have just recently moved to Singapore and am very interested in keeping bees. I have been fascinated with them for some time and was inspired by urban bee keepers in New York and Japan. If there is a way that I could be put in touch with any local keepers or enthusiasts in order to see them being kept first hand it would be appreciated. From the research I have done I understand that there are several species native to here and also a stingless kind, which may be more appealing to the locals. What a wonderful site to stumble upon. Keep up the good work. Ruth: Welcome to Singapore, Jac! For all these years, strangely I haven't met anyone who is keeping bees in Singapore. I've a strong feeling that these people like to remain "underground" as keeping bees can be a rather sensitive subject here in Singapore (I suppose the risk of their neighbors informing the authorities to take away the bees is pretty high). I'm still figuring how to get some enthusiasts to form a community. And when I'm able to do that, you will definitely be contacted. But meanwhile should you (as well as anyone out there) have good links to the schools, you may want to start exploring from there as keeping bees in the name of education may be one of the easiest avenues to get an activity of this nature going. Stingless bees are definitely an attractive option for schools to study the life and ways of the social insect! You may want to read my brief blog article on stingless bees here: Stingless Bees are an Eye Opener. I keep bees in Hong Kong, as do friends. My two hives are located close to my house. The Asian Apis Cerana bees are not aggressive. Many villages have behives in the midst of houses and there are no problems. When swarms occur the bees are not dangerous. You could have a problem in Singapore with the spraying that is done for mosquito control. This would be likely to poison bees as well. It would be nice to see that this hobby was accepted and encouraged in Singapore. Ruth: Thanks for stopping by, Colleen. What a great privilege to own your own hives! Totally agree that Apis Cerana bees are not aggressive at all. I had thousands of them buzzing around me for about an hour when I visited a beekeeper in Hong Kong recently and was never stung. You may be interested in this post: In Search of Honey and Bees in Hong Kong. Hello, i have a little informal bee hive outside my home. informal, because they came by their own, living in a crack in the wall in my hdb block outside my window. I started off with antipathy with the bees simply because they would always fly into my home in the mornings (probably attracted to the light) and buzz around on the floor for me to step on especially when i'm half asleep. Numerous calls to town council helps but actually doesn't really help since the bees seem to like the crack in the wall between my floor and the neighbour's below and in no time at all, i would get my morning visitors again. And so slowly, like all things, you get used to them (learning how to move around them), and like and treasure them. Occasionally, i notice that the bees would fly in, can't find their way out, and seem (I have no idea) more disoriented than usual, spin around a few times and basically give up and start to twitch and then die. If you get to them in time, and take them back out to the window to let them out, they seem to revive, get their bearings and be able to fly out and do their own thing. I tried doing some research on this, but the stuff i read about online about parasites, colony collapse, etc doesn't seem to apply. Does anybody seem to know what that's all about, and what's happening to my little adopted bees? Are they just stressed? Ruth: Mel, what an interesting encounter with the bees! The bees like you (smiles). I've no idea why your adopted bees appear to be stressed and if it has anything to do with CCD, but what you've described seems to suggest that they might have been poisoned. As much as I think the restrictions on beekeeping are worth of a concern, what matters more is the avenue to educating people on how to be a beekeeper and how to manage a healthy colony. Are there any ways you are able to point me in the right directions? Could you share your experience with how you get started with learning beekeeping? Ruth: Ellis, I'm not sure if educating people on how to do beekeeping would matter more when there is so much concern and fear about having bees around and so little awareness about how precious bees are. It's interesting (because it's very rare) to meet people who are serious about beekeeping here. Are you a local here? By the way, I am not a beekeeper and have zero hands-on knowledge about beekeeping. To get closer to your goal related to beekeeping, my suggestion for you would be to first visit the bee farms in the neighbouring countries (for convenience reasons). Obviously Singapore's ban on beekeeping isn't working, otherwise there wouldn't be a need for those exterminations. As seen from a distance, it would seem obvious that it might as well be dispensed with. Ruth: Your response to bees and honey is always ever so inspiring and uplifting. Thank you so much, John. I think it's brilliant to start beekeeping in Singapore, for as long as it is organic and an honest product (no added sugar/sweeteners). Othewise, it wouldn't be too far different from the ones on our supermarket aisles and that consumers would probably still continue buying Australian/New zealand products. I for sure, would want to buy raw and fresh honey! Local honey would be so cool and there's no reason why we can't do, I mean no climate issues (apart from space) right? A big yes we can from me! Sounds like a good idea to me, having bees in our own backyard. Why not? Ruth: Hi Maggie, your neighbours would probably complain big time about the bees :) It's going to take some education for the community to embrace the bees. I will be interested should that ever happen. Thou don't know if it will be an issue to contain the hives in the farm itself. Ruth: Albert, pest control companies at the moment seem to be the only resort for us to remove the hives around, because there are no beekeepers in Singapore to properly handle them. And we have to change the public's perception that bees are a public nuisance (due to the fear of being stung) through education. It's a good idea as we will have an experience to see how honey is really formed by bees. We have only read about how honey is formed. We will get the real idea if we can see it ourselves. Why not? Ruth: Totally agree, Mathina. I would love to see beekeeping going into the community one day. I think it would be more economical for producing own honey than to depend on external sources. It comes across to me as a very interesting idea, although I don't know how to go about doing that. Definitely there will be people interested. Especially if you doing it for the benefits of the community! Aside from the fact that honey will equal gold should we ever lose bees entirely. They pollinate that's the real fact we need to look at. They keep our Eco system balanced along with many others. But Bees are our very important supporters and our friends. 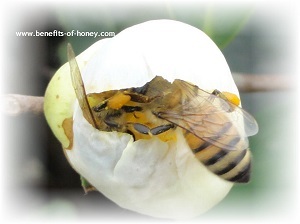 It's a fact that bees pollinate fruit trees and other plants. Traditionally they are in the wild taking nectar from wild flowers from varieties of trees. More research is needed to bring the bees to town. So let us not join the band wagon like other cities but invite more feedback and share experiences by those already breeding in urban cities. Education plays a lead role. Ruth: When there is enough understanding of the vital role of bees in our food chain and environment, beekeeping will make sense. Motivation would be different for different people - beekeeping as a novelty past time, an intimate encounter with Nature, saving the bees, for honey production, benefits of eating local, etc. End of "Keeping Bees in Singapore". Back to "Can We Have the Honey Bee Back, Please?"